In February 2017, Blaustein Hall, the glass-windowed banquet hall of Beit Shmuel-Mercaz Shimshon, hosted the annual memorial concert of Debbie Friedman z"l by the Hebrew Union College-Jewish Institute of Religion in Jerusalem. A member of the HUC-JIR faculty from 2007 until her passing in 2011, Debbie Friedman inspired students through her creativity and musical talents, helped guide their spiritual and leadership development, and provided them with innovative strategies to transform congregations into communities of learning and meaning. In 2011, the School of Sacred Music was renamed the Debbie Friedman School of Sacred Music so as to honor her legacy. 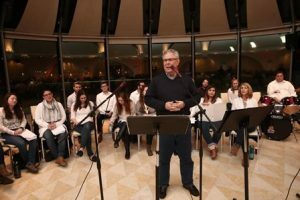 This year’s “Melave HaMalka” was directed by Cantor Tamar Havilio, Cantor of the Taube Family Campus, and was organized by HUC-JIR’s National Office of Recruitment and Admissions. 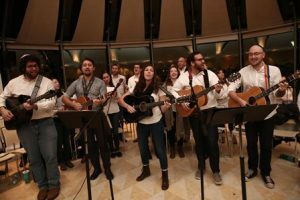 Cantor Havilio prepared a choir of cantorial, rabbinical, and Jewish education students from the Year-In-Israel Program and Rabbi Naamah Kelman, Dean of the Taube Family Campus, welcomed the crowd of over 300 guests. Rabbi Daniel H. Freelander, President of the WUPJ and an alumnus of HUC-JIR, addressed the crowd during the concert, recalling Debbie and her unique song-leading style. WUPJ guests in attendance included participants of the EIE Heller High School program of the Union for Reform Judaism (URJ) and of Shnat Netzer, a post-high-school program for British, Australian and South African teens from Netzer Olami, the global Reform Youth movement of the World Union; along with lay leaders from Australia, North America and Europe participating in the Beutel Leadership Seminar 2017. Please fill out this form to share "Beit Shmuel-Mercaz Shimshon Welcomes Over 300 Guests to Memorial Concert in Memory of Debbie Friedman, z”l" via e-mail.